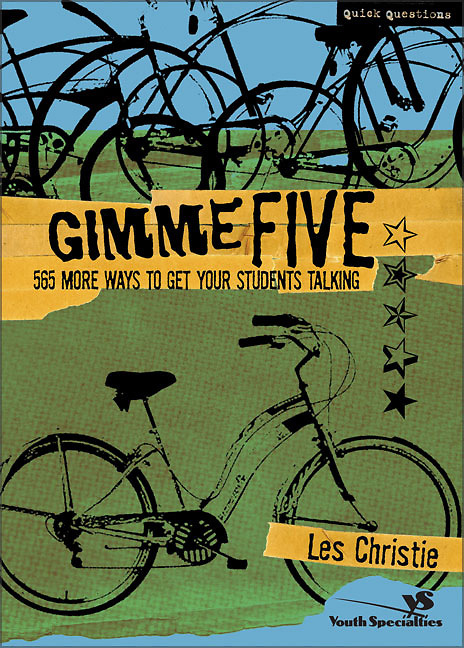 Gimme Five is the tool to have when you want to get your group talking on a ministry night, retreat, road trip, in their small groups, or at your home. These provocative and charming lists will get kids talking, laughing, debating, and thinking anytime, anywhere. A great tool for volunteer youth workers who need something to get conversation going! With more than 500 prompts, Gimme Five is sure to get your students talking, thinking, and laughing as they name their five things—foods they hate, situations that make them cry, favorite television shows, and much more. You’ll find funny stuff, as well as hot issues and scenarios that’ll make your students dig deeper. Whatever route you choose, Gimme Fivewill spark fascinating conversations.